The main purpose of my November roadtrip was to make it to this location- The Kingston Memorial Centre. The Frontenacs have a new venue in Downtown Kingston currently under construction, and set to open in February, so if I wanted to see OHL action and the famed old barn I had to act quickly. 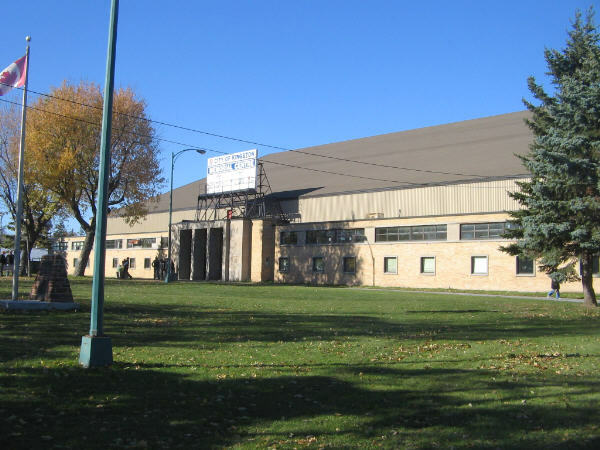 I have read and heard that this was an old, run down, outdated building that is in dire need of replacement, and it was all those things, yet I also found it to be a neat old barn with a great hockey atmosphere. The KMC itself sits on a Fairground in the middle of a neighborhood, and there is both on street parking, as well as paid parking on the grounds itself. There is a nice lawn in front of the building with some trees, which sets it apart from most buildings, which are either jammed into the city block which they occupy, or surrounded by a concrete wasteland of a huge parking lot. Upon entering the front doors of the almost 60 year old building, the ticket window/box office is to the right, and I was able to secure a center ice seat near the top for $16. The Fronts have not been drawing too well this year, and I was glad to be able to snag a good seat. As with a lot of OHL rinks all seats are the same price. Once inside a concourse leads all the way around the building, and there is a Kingston Hall of Fame to the right when entering the doors, however on this day they had a half dozen tables set up in the hallway which makes up the hall of fame and were having a kids birthday party. Walking up the steps to the top coucourse behind the seating area you get a good look at the rink, which holds a little over 3000 spectators. There is a large portrait of the Queen hanging from the ceiling behind one goal. The top concourse is amazingly narrow, and I cannot see how they allow standing room up there but they do. The roof is made entirely of wood, and if you look closely you can see where the roof has been patched over the years as some of the boards which make up the roof are of a lighter and different shade of brown. There is a traditional scoreclock hanging above center ice. Seats go all the way around the rink, and the chairs themselves are the old painted wooden chairs which are not the most comfortable, but are rather nostalgic. I remember sitting in similar seats when I was a kid at Boston Garden watching the Bruins. Some of the seats near the top are actually folding benches where 2 people would sit next to each other on a single folding piece of wood with no arm rest in the middle. The sight lines from my seat at center ice was good, although the seats could use a little more pitch as the rows are not angled too steeply. It was neat sitting in the section I was in as there is no glass behind the bench, and the area is just open, so you can hear the players and coaches talking. Pretty cool. After checking out the seating area I took another walk around the lower concourse. There are a variety of food stands, and I wanted to have some poutine, but had some at the mall in Belleville earlier in the day. There is a beer garden area, but it appears that you have to drink the beer in that area as they had a few tables roped off. The washroms are obviously older, but were sufficient for the crowd on hand. I was also able to pick up my souvenir Fronts puck from the novelty stand, er I mean the closet type room they use to sell souvenirs. It seemed to be a storage room with glass windows which had merchandise scattered all about. I was able to find the puck I wanted, however there were no prices on any of the items, you had to ask how much everything was. By then it was time for the warmup and the game. They also had various rooms off to the side of the concourse, including a room with a glass window where they did a between period interview with a Fronts player for the TV broadcast. The lighting in the rink is rather dark, but sufficient. The PA is nothing special, although the DJ did an excellent job of picking appropriate songs for the game situations, including playing a dial tone sound over the PA while the ref had trouble with the scorekeepers phone when trying to get a replay ruling on a disputed goal. The Fronts fans seem like a good bunch, who cheer loudly when their team scores, are not afraid to get on the ref's case for a bad call, and generally have a good time despite an unsuccessful team for the last few years. I really had a great time at the Memorial Centre for this Sunday afternoon game. The game was decent as well as the Fronts took the win despite Guelph making things interesting by scoring 2 extra attacker goals in the last couple minutes to make the score close at the end. I think the atmosphere in old barns like this is great, and the 2200 or so who came out for the game were more than willing to put up with the uncomfortable seats and old worn out building. I am afraid with a new facility, and likely more focus on the corporate side of the game that much of the great atmosphere will be lost. I would recommend hitting a game at the Memorial Centre while you have the chance. If you miss out on the Fronts this year hopefully you could still catch a Queens University game there as I believe they play at the KMC as well. 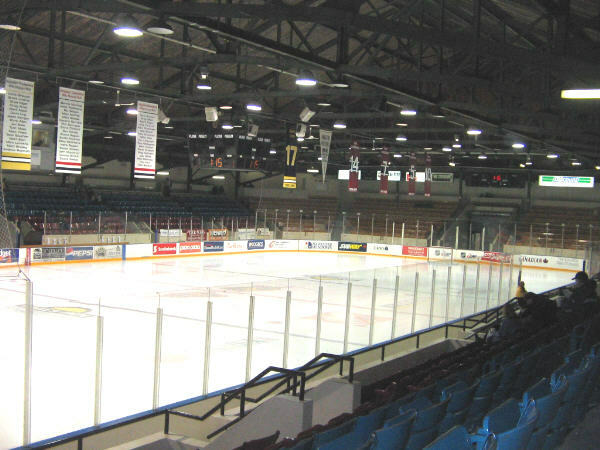 At this point I dont know of any plans to tear the building down, and since it is part of the Fairgrounds it is likely to remain, but seeing OHL hockey at this historic building is likely the best experience a hockey fan could have at this old rink.